There was still plenty of daylight left as I was returning from Sharpsburg last weekend, so I took a rare detour from Alt-40 over to Fox’s Gap. There are a pair of interpretive signs, two monuments, and a regimental tribute at the spot where the road crosses the Gap, noting the combat there on 14 September 1862. But that’s all there is to see as one arrives. There was no one else there when I pulled up. It was blessedly quiet. I took a couple of snapshots to bring some of the place home with me. The battlefield of Fox’s Gap consists of an otherwise unremarkable meadow and patch of woods covering about half a mile of the crest of South Mountain. In among the trees is the dramatic North Carolina monument [picture, more] erected in October 2003. Having just come from Antietam and the specific site of the 17th Michigan Infantry’s adventures there on 17 September 1862, it was destiny, I guess, that I should come upon that unit again at Fox’s. 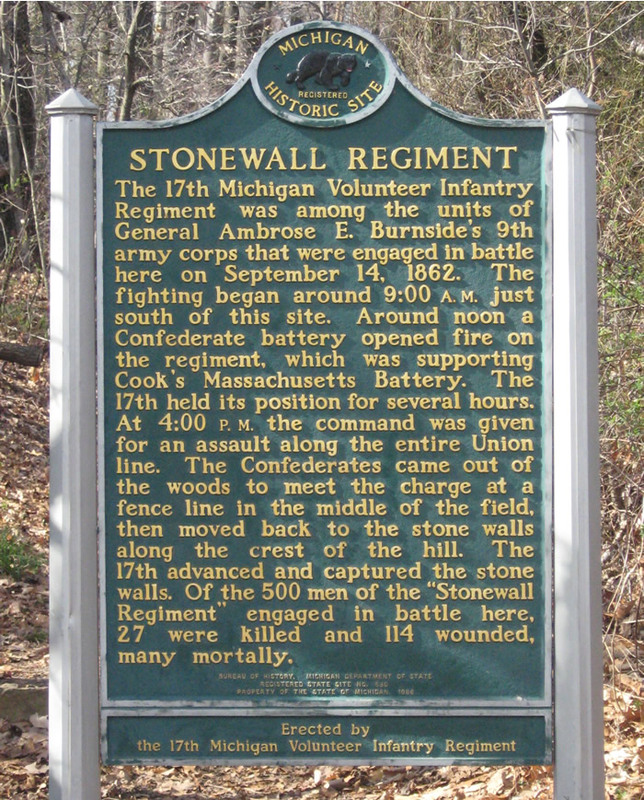 Along the road is this tablet put up in 1986 by reenactors of the 17th Michigan, who have been active in preserving and noting their unit’s history. 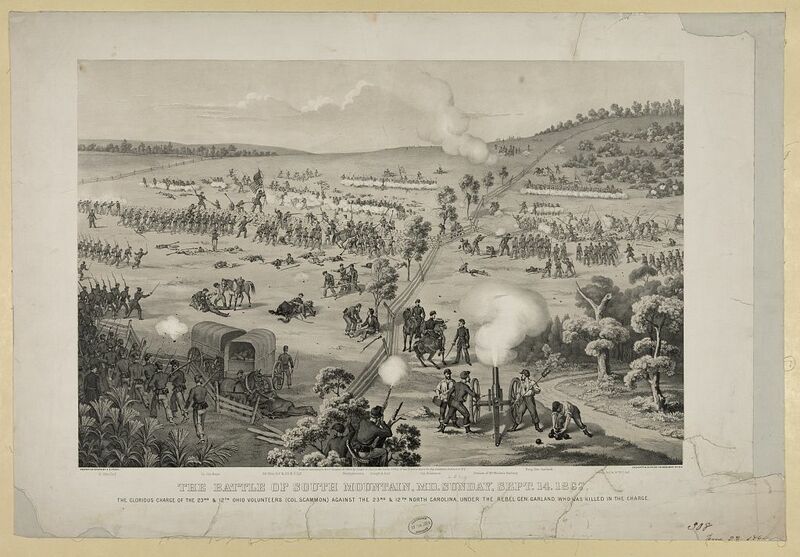 They’ve also scanned and posted a fair copy of the CWPT map of the battle at Fox’s Gap. 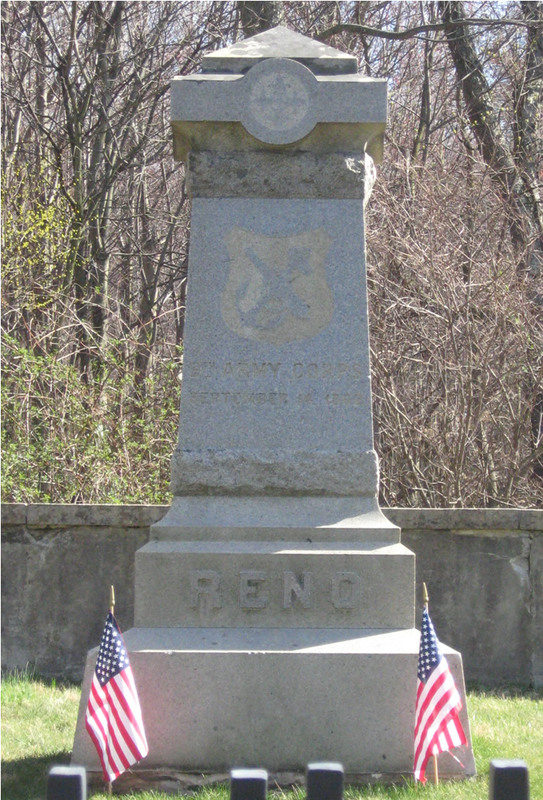 Somewhat older is this large obelisk placed in 1889 by veterans of the Federal IX Corps to mark the spot where their commander Major General Jesse Reno was mortally wounded in action. 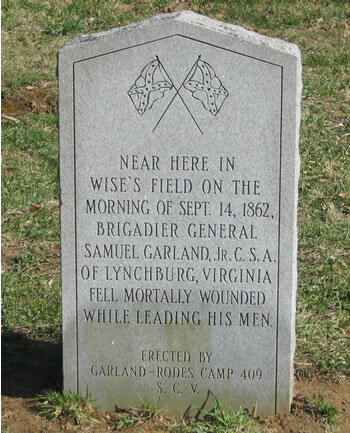 Added to the landscape at Fox’s Gap more than 100 years later in 1993, this modest headstone-sized marker remembers the other General officer killed here, Confederate Brigadier Samuel Garland. 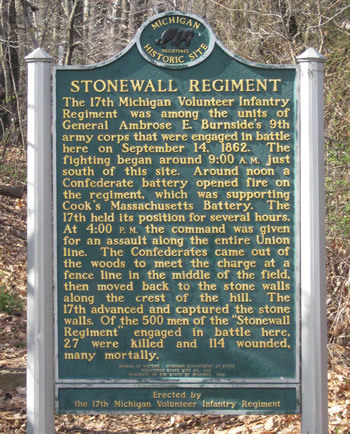 How does one go about putting up a monument on a Civil War battlefield, as has been done fairly recently with the 17th Michigan marker, Garland stone and North Carolina Monument? When is it not a good idea? Remember the flap of 2005 about putting additional unit memorials on the field at Antietam? I’d appreciate hearing from those in the know about the legal and ethical dimensions. 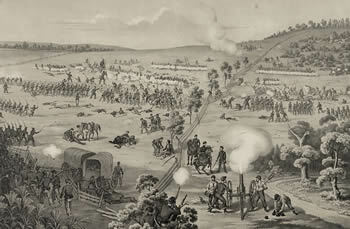 The glorious charge of the 23rd and 12th Ohio Volunteers (Col Scammon) against the 23rd and 12th North Carolina, under the rebel Gen. Garland, who was killed in the battle. For more about the history of Fox’s Gap, see the online home of A Gap in Time, a 2002 archaeological project of the Indiana University of Pennsylvania. For even deeper study, find their results, along with recommendations for further preservation and interpretation. 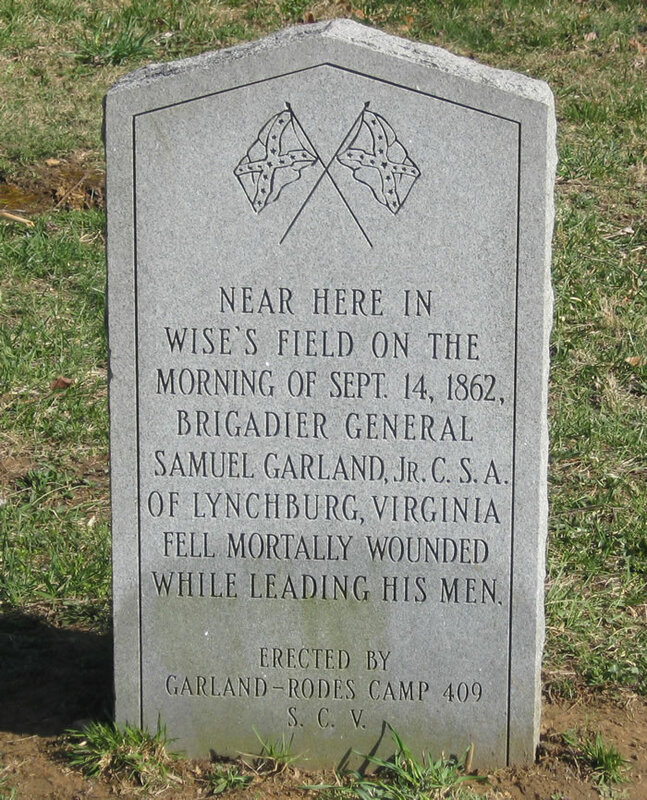 The Garland monument was placed by the Garland-Rodes SCV Camp #409, Lynchburg, Virginia. All of the modern installations were made under the auspices of the Central Maryland Heritage League, who’ve also posted a summary page on the battle. And, by the way, Reno’s son Jesse W. was the inventor of the escalator. Garland’s wife and son Samuel, however, tragically preceded him in death in 1861. A good question Brian. Most of the monuments, and interprewtive plaques, etc. at Fox’s Gap are on private property. Since they do not need to go through state or national scrutiny, it is fairly simple to do. It does, however raise issues of appropriateness, density and bias. 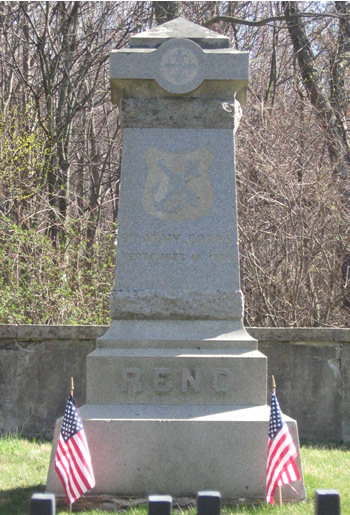 The NPS owns the Reno monument, after the fact of construction, but most of the land is still not state owned. Should anybody that wants to place a monument be allowed to do so? How many can be placed before we stand accused of ruining that which we sought to preserve? Should interpretation be vetted, or does everyone decide their own meaning of events and people? Obviously my bias is that monumentation and interpetation follow an exhaustively researched and objective plan, but with privately owned land, that is not possible. Oh, and before I forget, North Carolina has a beautiful monument a couple hundred yards dowen the road. The first weekend in June the MD Park Service is sponsoring a living history weekend at Fox’s Gap that should be a great event. They have permission to allow cannon to occupy the ground where Bondurant’s AL battery first fired at the Ohio troops of Cox’s Division. We spent the previous Saturday up there cutting out a non-historic tree line, also very satisfying. I agree with regard to appropriateness, density, and bias. Down the mountain a ways at Crampton’s Gap, several interpretive markers were setup under the Blue and Gray Trail. While these are appropriate and I don’t detect a bias, the density level is a bit much for even me, who likes to record the markers. I count over 20 “items” within 100 feet of the War Correspondent’s Arch. Good content, but can be overwhelming to the visitor. Thanks Tom and Craig – you’re talking about the same kind of things that worry me. With respects to the monument to Sam Garland… he was kin to Confederate General James “Pete” Longstreet. Sam Garland was from Lynchburg, VA and in command of a brigade of North Carolina troops. His mortally wounded body was carried from where he was shot, down the woods road (now part of the Appalachian Trail) to the Mountain House and laid on the porch of that Inn…where he ultimately expired. I have read/heard that Sam Garland actually received his mortal wound from the rear…….. Thanks for the add-in Gerry. By ‘rear’, do you mean the direction of his own troops? I just wanted to make you aware of two books I have written that relate to the Battlefield of South Mountain in Maryland. My ancestors, John, Frederick, and George Fox lived at Fox’s Gap in the 1700s or in the vicinity. The Land Tracts of the Battlefield of South Mountain was published in 1999 and identifies all the land tracts of the battlefield. I traced many of the monuments and other historical sites back to the original land owners in the 1700s. On May 2, 1755, General Braddock, George Washington, and Governor Sharp passed through Fox’s Gap on their way to capture Fort DuQuesne. My second book, The Braddock Expedition and Fox’s Gap in Maryland was published in 1995. Both books are available from Heritage Books. Thanks for the pointers, Curt. I hope the books are doing well.